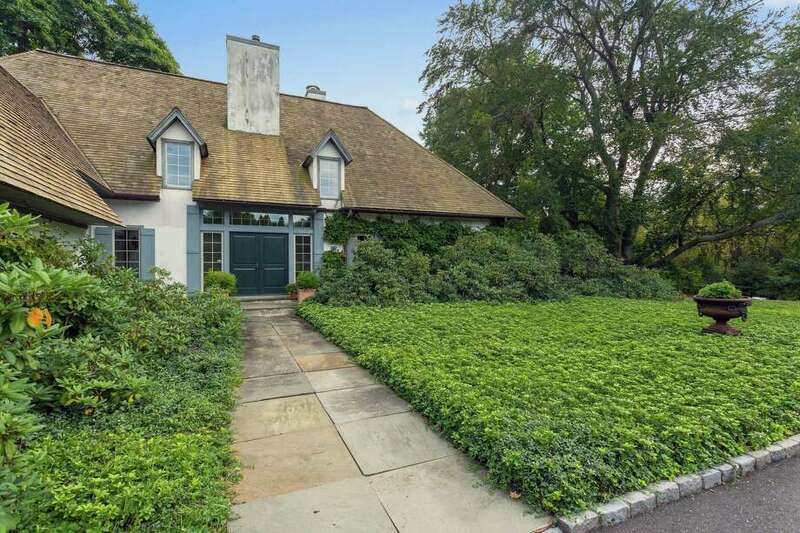 A French country cottage was built in 1980 on a portion of property originally part of the Bedford Gardens and Estate at 77 Beachside Avenue in Greens Farms. WESTPORT — Frances Hodgson Burnett’s beloved children’s book “The Secret Garden” was first published in 1911, right around the time that noted Westport businessman and philanthropist Edward T. Bedford began creating his own garden wonderland at his estate on Beachside Avenue. Bedford’s famed garden in Greens Farms was never much of a secret. In a 1932 article published in the Bridgeport Sunday Post, “Every day the great gates to his estate are flung open for all who wish to enter and feast their eyes on nature in her loveliest.” The public wandered through acres of Bedford’s paradise, which included 250 species of flowering plants and trees, grottos, pools, fountains, sunken formal gardens, stone pathways and a rock garden. Huge rocks were hauled to the property by donkey, according to the current owners, Susan and Robert Beeby. They purchased a nearly 3-acre level and sloping property, a portion of the Bedford estate, at 77 Beachside Ave. in 1979. As with Burnett’s fictional garden, Bedford’s began to decline after his death in 1931 and lay dormant for decades, becoming overgrown and unrecognizable. Unfortunately, they were never quite returned to their original splendor, which would be difficult today because Bedford employed 14 full-time gardeners, although the Beebys have made a valiant effort to restore the gardens. “The outside is an important part of the property and one of the reasons we bought the property,” Robert Beeby said. They brought in award-winning landscape designer James Bleuer, principal of Casa Verde Florist and Gardens of Southport, to help with the monumental task and did some of the physical work themselves, unearthing a stone staircase and clearing stone walkways. “We carted out 60 truckloads of trees and brush before we moved in,” Robert Beeby said. They encouraged rhododendrons and andromeda to grow and planted dwarf junipers, ajuga, lamium, day lilies, and pachysandra. “There is no residence in the state of Connecticut that has as much pachysandra as we do. It’s green all year, and we like that it keeps out weeds,” Robert Beeby said. In 1980, while they continued their work to reconstruct the gardens, the Beebys also built their home, a seven-room cream-colored French country cottage of 4,825 square feet. John Houk, of Wilton, was the architect and Michael Sochacki the contractor. Its exposed beams are from a barn in upstate Vermont. Travel down the very long circular Belgium block-lined driveway to reach the house with its striking wood mansard roof, a slate path and carpet of pachysandra leading to the French doors of the front entrance flanked by wide sidelights and a transom. From the foyer, step down into the generously sized formal living room, which features a fireplace, exposed beams, a bank of floor-to-ceiling windows, and French doors to the terrace near the Gunite in-ground swimming pool. The hand-carved detail of the mantelpiece was specifically made to replicate the design in an antique armoire that sits in the room. Step up into one wing where there is a large, first floor master suite with two baths, a dressing room, and walk-in closet. In the opposite wing there is a family room and kitchen. The family room features a dining area, fireplace with a hand-hewn beam mantel, exposed beam ceiling, built-in bookshelves, a wet bar, and two sets of French doors to a covered patio and terraced garden. Tall wood panels on two walls fold open or closed to separate this room from a large wet bar and the kitchen, which has granite counters. A room off the kitchen serves as a laundry room and a home command center with a built-in desk. Three additional bedrooms and two baths are found on the second floor, and one is large enough to be an office, art studio or playroom. “Edward T. Bedford was a personal friend of John D. Rockefeller and his business acumen was highly regarded. He was the frequent subject of news articles and was even mentioned in Dale Carnegie’s seminal work, How to Win Friends and Influence People,” the website says. Briggs Cunningham, an entrepreneur, race car driver, and in-law of the Bedfords, maintained a garage on the property for his collection of cars, Robert Beeby said. This secluded house and property are perfect for year-round living or as a fabulous weekend retreat. They are conveniently located only minutes from local beaches and the Greens Farms train station, all only one hour from New York City. The Beebys’ gardens are not open to the public, but Robert Beeby said members of local garden clubs have comes through. Those who want to enjoy the beauty of this property and house will just have to purchase them. For information or to make an appointment to see the house, contact Nancy Dolan and Lynn Dolan of William Pitt Sotheby’s International Realty; Nancy at 203-258-2302 or ndolan@williampitt.com, and Lynn at 818-620-0554 or ldolan@williampitt.com.